The problem in the first half here was to do with mentality. Both sides were happy with keeping it tight, and in their respective situations it’s not hard to see why. Arsenal, having been thrashed by both Chelsea and Manchester United in their past two games, were content to prevent a whitewash. Liverpool, on their first decent unbeaten run of the season, were content to keep it going. Tactically, the game was so stifled because the two midfield triangles effectively cancelled each other out. 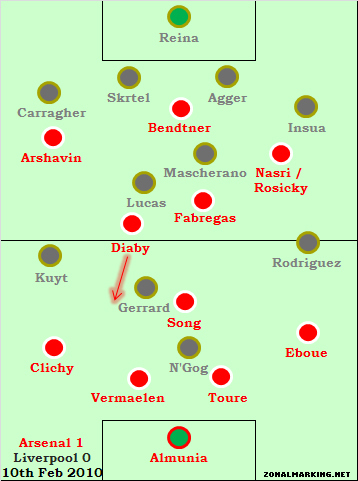 This is not to say the two sides were playing the same systems – Liverpool’s was a 4-1-4-1 that became a 4-2-3-1 in possession, whilst Arsenal played their usual 4-1-2-3 shape. But because Arsenal’s midfield three was a “1-2″ and Liverpool’s was a “2-1″, each midfielder was closely faced with an opponent. So Gerrard picked up Song, Lucas picked up Diaby, and Mascherano picked up Fabregas. And, when Liverpool had the ball, the roles were reversed. Add to this the fact that the full-backs picked up the opposing wingers, the only players that were in any way ‘free’ were one centre-back from either side, hardly where you’re going to launch attacks from. Liverpool probably had the advantage in the first half, because their wide players played a lot deeper than Arsenal’s, and therefore had slightly more time on the ball. But, equally, Arsenal’s advanced wide players were pushing Liverpool’s full-backs back, and therefore Liverpool couldn’t attack with as many players as Arsenal could. And so it was pretty much a stalemate. Arsene Wenger’s response was to shift the midfield triangle slightly – Diaby played deeper, alongside and sometimes even deeper than Song. Therefore, he had more time on the ball, with his first half foe Lucas remaining reasonably deep. This made the midfield less congested, slightly more open, and meant that both sides had more time in the midfield to get balls to the wide players. It was, by coincidence, Diaby who got the winner in a rare surge forward, although it would be hard to argue that this was due to him playing in a deeper role. But who knows? Perhaps the greater space he was allowed in the second half meant he felt freer to make bursts into the box. The one criticism of Liverpool would be that they didn’t put Arsenal’s full-backs under enough pressure when they had the ball. The height advantage Dirt Kuyt has over Gael Clichy means that long, left-right balls might have been a good idea, especially considering how Manchester United targeted Clichy last weekend. Maxi Rodriguez seems composed on the ball, but he seems to lack the ability to go past players that he had three or four years ago. This Chalkboard shows Diaby’s first-half, compared to his second-half. Although he was involved in more passes in the first half, the fact he had more time on the ball in the second half meant that he had a 100% passing accuracy rate (the one misplaced pass shows up as the 45+1st minute, so the first half) which kept Arsenal’s attacks flowing when they may have broken down in the first half. A much-needed tactical victory for Arsene Wenger. toure? are you having a laugh? No idea what happened there! Still not sure Arsenal play a 4-1-2-3. Wenger himself has described it as a 4-1-4-1 and that does seem to fit better, as our wider players come inside and both Diaby and Fabregas tend to drift into wider areas at times. The four players ahead of Song and behind Bendtner tend to be quite fluid. Without the ball, it tends to become a 4-2-3-1, with Diaby or Denilson (if he plays) dropping deeper alongside Song and Fabregas remaining quite high up the field.